The Cycle 1 pre-school classroom caters for children aged 3-5 years of age. Children under the age of six have extraordinary powers of mind. They have a universal, once in a life time ability to absorb knowledge from their surroundings with what Montessori called the ‘absorbent mind’. The absorbent mind is at its peak receptivity during the preschool years. In order to be calm and happy, children under 6 years of age need to explore and discover. They are curious about everything. 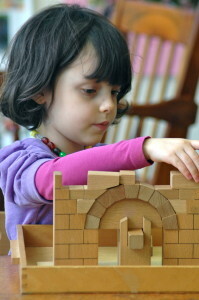 They learn by touching and manipulating objects. They are keenly attuned to everything that stimulates their senses: shapes, sounds, smells, textures and tastes. They want to master the movements of their own bodies by learning to balance, run, skip and jump. They also respond to order because of their innate need to know where things belong and how pieces fit together. The children of this age are also absorbing the social norms and graces of the society in which they live. In a Montessori environment the child is presented with the lessons of the ‘Grace & Courtesy’ curriculum. The classroom is prepared by the teacher to meet the needs of the child. To encourage the children to work independently in a safe and calm environment. To enhance knowledge of their world around them, planting seeds of interest for future learning. To assist with transition from the home/childcare environment to preschool via a Transition Program where a child of two years attends with an adult parent/carer for one session per week. Toddlers attend over a period of one to two terms prior to commencing pre-school at around three years of age. riods when it is easier to learn a particular skill. These periods come at slightly different times in each child’s life. Our teachers are trained to recognise these sensitive periods so that they can teach the skill or concept when each child is ready to absorb it. 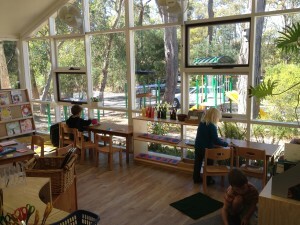 Our pre-school staff strives to make the transition from home to school a gentle one and respond to individual needs. The Practical Life curriculum provides the link between home and school where children can acquire daily living skills. Children develop concentration, independence and co-ordination through practical life activities such as food preparation, washing, pouring, polishing, threading and caring for the environment. The sensorial Montessori materials are designed to assist children in focusing on detail, becoming more perceptive and understanding concepts though matching and grading materials and using their senses. The materials in a Montessori classroom are carefully designed and thoroughly researched to fit the developmental needs and characteristics of children. We use the Montessori materials to enhance the child’s understanding of numeracy, literacy and learning for every day life. Our classrooms also feature many familiar materials including art, craft and painting equipment, puzzles and construction sets. Children have a strong sense of order so everything has its proper place and there are regular routines. Classroom fittings and equipment are deliberately sized to suit the needs of the child. In addition the Pre-school curriculum provides children with experiences in geography, history, biology, art and physical education. Children enjoy a whole class Music lesson once a week with the specialist Music teacher and have the opportunity to work with our Indonesian teacher once a week if they choose to. Children enter this program around 4½ years of age however entry into this program is determined on the child’s readiness and availability of places. Extended Day children attend from 9:15 a.m. – 2:30 p.m. four days a week and a half day session on Wednesday. These sessions are a more conscious construction of personal and academic skills in preparation for a successful foundation to the years of primary education. Extended Day children also enjoy a Physical Education lesson with our specialist PE teacher once a week and two music sessions with our specialist Music teacher. Care facilities are available for the students enrolled in the Pre-school and Extended Day programs after they have completed their Pre-school or Extended Day session. To apply for this program a Registration form needs to be completed which is available from the school office. The Government’s Child Care Benefit applies to Pre-school, Extended Day and Long Day Care programs.